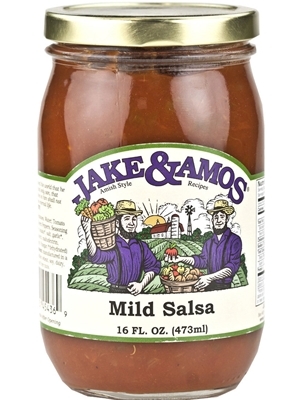 Jake and Amos Mild Salsa is simply the best! The combination of diced tomatoes, green pepper, onions, garlic and other seasonings goes great with your favorite chip. Ingredients: Tomatoes, Water, Tomato Paste, Onions, Green Peppers, Seasoning Blend (dextrose, tomato*, salt, garlic*, modified food starch, maltodextrin, jalapeno*, spices), Vinegar (*dehydrated).